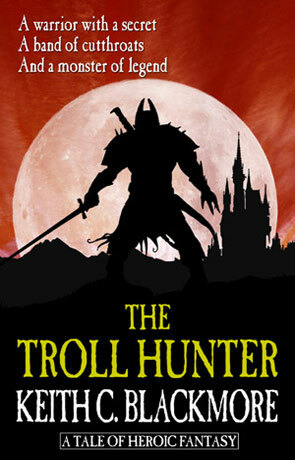 The Troll Hunter is a heroic fantasy novel by Keith Blackmore. Fresh from the battle infirmaries, a band of rogues, cuts throats and killers return to duty and are ordered north through the war torn country. They know nothing of their mission except that they must protect a mysterious Koch (armoured wagon) at all costs. Driving them ever forward is the murderous Rusk the Two Knife and his Koor officers, led by the enigmatic Bloor, the only cavalier to survive the Field of Skulls. Together, they will march into the unknown, and arrive at the teeth of hell, only one man will possess the skills necessary to bring the survivors back. The Troll Hunter is so well written, you'd be forgiven for thinking the author had been publishing for years. The novel devles straight in without any real introductions and describes the harsh conditions of war, from the abusive and cold hearted Rusk to the subtly dangerous and imperious Cavalier Bloor. The writing is tight, gritty and fast with minimal backstory, the emphasis here is on the characters and plot, little room is spared for explanations and there are no long winded meandering paths describing every detail of the world in which the story is set. The fantasy element is very much underplayed, instead we have a much more realistic and dark edge to the narrative which describes a well laid out plot that really drives the imagination and keeps you hooked. The main characters in the book are just great with everyone out for themselves and quite eager to stab each other in the back. Two Knife is my favorite, an iron hard seasoned fighter with an arrogance (or perhaps confidence) to match. Along with the great plot and interesting characters, we also get some most excellent and vivid fight scenes that are described in great detail and once the titular beastie rears it's ugly head all hell breaks loose. This is Heroic fantasy at it's finest. Anyone who likes a sharp story with a more down to earth, gritty feel than the high fantasy fare will just love this book, very much recommended. Written on 18th December 2010 by Ant.